Bloomberg Writer Anna Massoglia (@annalecta) delivers facts on the influence of Big Pizza in Government. From campaign expenditures to lobbying dollars, these slices of info will fill you with existential dread, suspicion of your government, and...cheese? GOP Presidential candidate (and serial water sipper) Marco Rubio took a break from campaigning in Iowa today to totally annihilate a kid in the head with a football. You can watch the short clip above, but it is even better in GIF form. And even better in Pokémon GIF form. 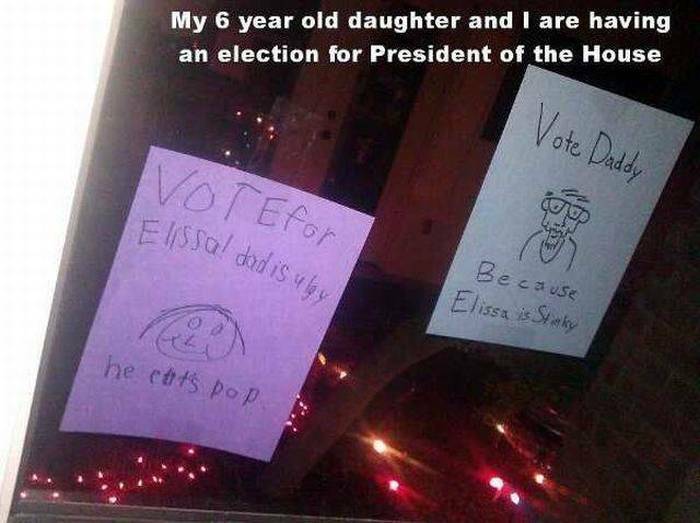 Dad and Daughter are Candidates in Their Own Election! Disclaimer: Sarah shops around for male genitalia so this video is not safe for work. The campaign aims to close the wage gap by crowd funding an admittedly ludicrous number: $29,811,746,430,000. That number represents how much women lose when each of the US's 69 million female workers are paid nearly $500,000 less than men over their working careers. The money raised from the Equal Payback Project will go towards funding the National Women's Law Center – a non-profit that works against employment discrimination and focuses on legislative issues to promote gender equality. Aziz Ansari puts being a feminist in even simpler terms with his perfect analogy a little after two minutes in on this appearance on David Letterman. Remembered to vote? Didn't remember? Pundit Kitchen understands.